Recently, I had to find instances of where specific Gravity Forms were being used. This came with multiple challenges. This code returns a list of posts (ID and post_title) that contain Gravity Form 7. This code returns a list of posts (ID and post_title) that contain Gravity Form 7 in their post meta. Manually wrangling these two separate SQL statements is not very efficient, so I wrote a custom WP CLI command to do this for me. Originally, the command was going to search for a specific Gravity Form shortcut but I realized it was easy to generalize the code to search for any string. this seemed to work well until I noticed there were too many results. The problem was I was including revisions and autosaves. The post_name of a revision or autosave looks like the following respectively, 8-revision-v1 and 8-autosave-v1 (where 8 is the original post_id and v1 indicates it is the first version). This allowed me to add some additional WHERE clauses to exclude these posts. I address finding posts where the shortcode appears in the post meta in the next section. I don’t have a solution for adding the permalink to this SQL query but I did add it to the WP CLI command I wrote. this does not address eliminating revisions and autosaves. Since this SQL only queries the wp_postmeta table (and you can only determine if a post is a revision or autosave by querying the wp_posts table), I needed to do an SQL join, specifically a LEFT JOIN. If you’re not familiar with a LEFT JOIN (a.k.a. LEFT OUTER JOIN), I find this Coding Horror: A Visual Explanation of SQL Joins a good place to start. which let me then refactor further and exclude revisions and autosaves. Rather than wrangling these two separate SQL queries and manually merging the results, I was excited to create my first custom WP CLI command. I look forward to automating more of the work I do. 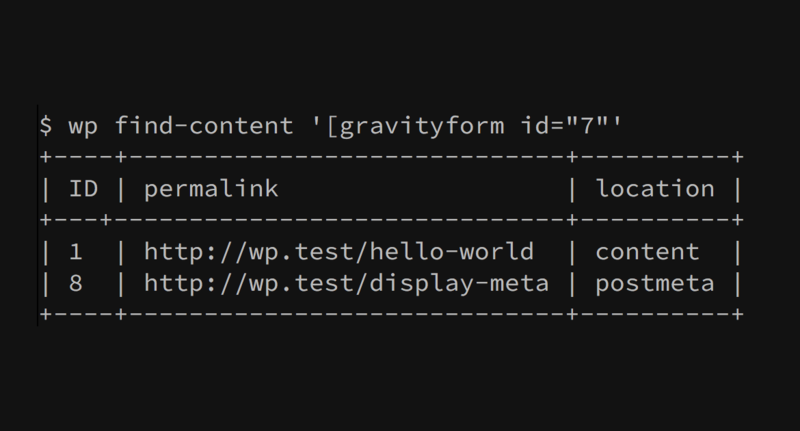 See WP CLI command find-content on GitHub.